Democrats vow a fight to the death, like Leonidas and his brave 300 facing off against the might of the Persian Empire at Thermopylae. The only problem is that unlike the Greeks, who prevailed in the Greco-Persian Wars, the Senate Democrats won’t here. The odds have been getting worse ever since the moderate wing of the GOP—Sens. Susan Collins (R-ME) and Lisa Murkowski (R-AK)—gave high marks of President Trump’s Supreme Court nominee, Judge Brett Kavanaugh. Odds are growing that Senate Republicans will remain united, while Senate Democrats could see some defections. Sens. Heitkamp (D-ND) and Manchin (D-WV) are the best bets. The initial salvos hurled at the Kavanaugh nomination have been weak. First, Democrats tried to say that no nominee should be confirmed during an election year; the actual rule is during presidential election years—and it’s rather explicit to say to least in that regard. The Washington Post even called them out on their crap. It’s called the Biden Rule, not the McConnell rule. Also, Justices Samuel Alito and Elena Kagan were confirmed during midterm years. It was an appallingly stupid move, one that once again shows liberals lack any sense of history. Even basic moments, like when a Supreme Court justice was confirmed. There’s been a lot of hysteria, a lot of nonsense, and almost none of it disqualifying. The Left’s meltdown over Kavanaugh also shows the warped view liberals have on our government, as if these nine justices sit around and just decide one day to overturn Roe v. Wade. They’re no legislators. They don’t do this, though for a movement that has decided to use the courts instead of the ballot box to push their progressive agenda items, I can understand their freak out. Well, elections have consequences—and you people lost. So between this and Colbert, I guess the Left’s leading attack on Kavanaugh is his first name? Now, we’re attacking Brett Kavanaugh because his name is “Brett.” NARAL said it sounds like a frat boy name, triggered that Roe could be overturned by five men, though forgetting that seven men voted in favor of Roe. Once again, zero grasp of history. Oh, and apparently, Judge Kavanaugh really likes baseball, spending tens of thousands of dollars on tickets…IMPEACH! What the hell is this crap? If his first name and Nationals’ ticket sales are all you’ve got, this isn’t the best material for packing sandbags in the great save SCOTUS campaign the Left is trying to drum up. Yet, let’s be honest. This isn’t about stopping Kavanaugh. I think most on the Left with cognitive function know that he will be confirmed. This battle is really bout drumming up the base for the 2018 midterms, retaking the House at least, and hitting the brakes on the Trump agenda. Specifically, they are sounding the alarm that confirming the conservative District Court judge could jeopardize one of the Affordable Care Act's most popular provisions — its protections for people with pre-existing health conditions. 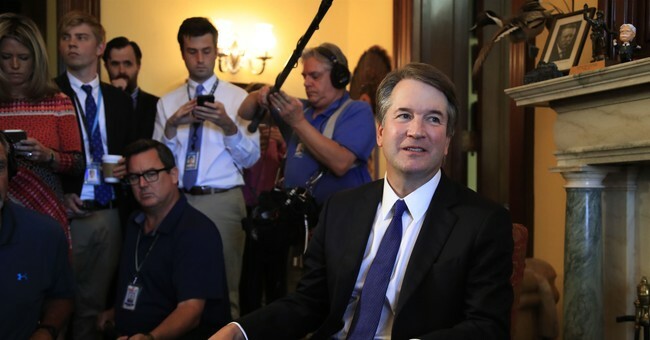 President Donald Trump's nomination of Brett Kavanaugh to the Supreme Court presents a band of government archivists and White House officials with a herculean task: wading through what could be millions of pages of records to produce what senators demand to prepare for confirmation hearings certain to be highly contentious. Kavanaugh's paperwork predicament — stemming from two years he spent in President George W. Bush's White House counsel's office and just over three as Bush's staff secretary — is not unique. Several recent Supreme Court nominees, including Chief Justice John Roberts and Justice Elena Kagan, also had White House stints that led to review and release of large volumes of records prior to their hearings. But the quantity of files potentially at issue in Kavanaugh's case could be unprecedented. Former officials believe millions of pages of emails and other documents circulated through Kavanaugh's office during his time as staff secretary. If Senate Democrats insist on receiving every page, the confirmation process could grind to a crawl. The volume of records at issue is likely to slow the timeline for confirmation hearings and may make any hearing before the August recess out of the question. Asked Monday about the idea that archivists could review a million pages of records within the next month, former National Archives official Sharon Fawcett said: "Not possible." The Democrats want revenge. The Democrats hate Trump, the GOP, and the rest of us who don’t kowtow to their agenda of equitable misery in the sociopolitical and economic arena. I think Democratic leadership knows the red state faction is shaky—and Kavanaugh’s pick makes it harder for them to create a solid case for opposition, which is why they don’t want to talk about it. This delay could work in their favor. Let’s say they gum up the works. No hearings or final vote until after the midterms due to the document requests. The increased enthusiasm from the Left could result in the Democrats retaking Congress. The House would be lost if the generic ballot advantage is in the double digits for Democrats, and should Marsha Blackburn lose the race to replace retiring GOP Sen. Bob Corker, Dean Heller bite the dust in Nevada, and Martha McSally fall short in Arizona, that’s a 52-48 Democratic Senate majority come 2019. The Trump agenda is dead, as is Kavanaugh’s nomination. The second worst scenario is if there’s a 50-50 split come 2019, in which power-sharing negotiations could also put the Kavanaugh nomination in dangerous waters. This is why McConnell wants to confirm him before the 2018 midterms, boosting GOP voter turnout and enthusiasm, which is also high. Democrats may be shooting blanks, but they could be in the works for outflanking the GOP. It could be a nothingburger, but always have your guard up with these people.